Sometime back,I got a mail from a person called Neena.She told me that she follows my blog regularly and she identifies with my style of cooking since,she was also a Konkani,born and brought up in Kerala,then came to Chennai.I felt even more happy when she made a recipe request.She asked me whether I could recreate the Kerala special-Porotta and Peas Masala in my blog.Your request is my command dear!! I followed Cham’s recipe for Porotta . Add curry leaves and onions and sauté till the onions become light brown. Add ginger garlic paste and sauté till the raw smell of the paste goes. Now add the tomato and the masala powders. Stir till the oil starts separating[At any point if you feel the masala might burn,add a few drops of water]. Now add the cooked peas and salt to taste. Slowly add the coconut milk,keep the heat on low. Add freshly chopped coriander leaves and serve hot. Goes well with Idiyappam,Puttu and Porotta!! Green pea masala looks yum Divya.. Simple & delicious. These porottas are my daughter's absolute favourite, especially when we go to Kerala. She loves it with kurma, this curry or sambhar! I think cooking innate. I have seen some struggle for yrs and still don't know how to cook well. I started cooking few days after I was married, had to cook or starve! I did it with ease like I had cooked all my life and I was 22yrs old! Yumm, a delicious combo that is. Love the layered kerala parotas. i just love this combo! your porottas look really good...i could never manage to get those layers! Aparna..thanks.My favorite too,glad that we get good porottas in Kerala restuarnts here;-).Just like Poori is boori in Kerala,Porotta is Barotta in Chennai..;-)!! Ashakka..yup,I'm discovering so many new recipes in my treasure house Vanitha..taking a break from baking and cooking up all those authentic delicacies!! Mrs.Kannan..thank you.This is the first time I'm trying to make porotta at home.It came out well,try Cham's recipe,it works!! Cham..thanks to YOU for coming up with such a great recipe.Since the said measurement only made 5 porottas,I thought of making some chapathis too,thats when the thought of making wheat porotta struck me,sad to say-it wasn't such a great idea;-)!!! Uj..thank you.Take your time..Happy shifting!! Lovely recipe. I am feeling hungry now. Will try it. yummy combo ..i would love to try this for the weekend..
lol at cooking not being your skill :)) The only time I made the kerala style porotta was when I wanted to make kothu parotta :)) This combo sounds delicious, and like Asha had said, I might have to try it with dried peas. I got so used to dumping the tender frozen sweet peas directly into dishes in the end here, that on my last trip to India I did the same with the peas my mom had. They took much longer to cook and I nearly ruined the whole dish by overcooking the rest, hehe. i love parottas, lovely color for the green peas masala! yummy meal! Wow..wonderful parotta here! Tks for sharing both recipes the pics r droolofying dear! 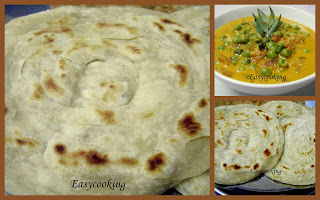 Wd attempt parotta once, since u hv beautifully put up the description! :) Thks again! So easy to make with frozen peas when you are running out of vegetables..Tried this twice...both times were appreciated greatly ! Since I'm a bachelor, I always search for these kind of simple recipes. Today I tried this with a slight difference. Instead of coconut milk I added fine paste of coconut, and it came well.